The RUMAS (Russian Ukraine Maslova) group’s A245 Guppy is a light helicopter concept first introduced as a prototype mockup at the 2009 MAKS airshow. Development on the Guppy began two years earlier in 2007. This helicopter design brings the tandem rotor design associated with helicopters such as the CH-47 Chinook or the CH-46 Sea Knight and adapts it to the light helicopter class. 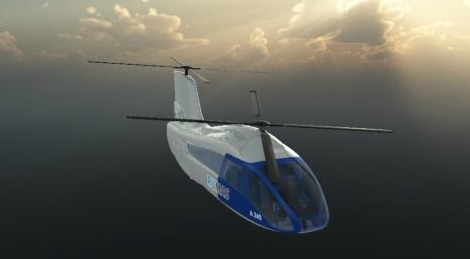 The Guppy is intended to push the boundaries of helicopter safety standards with a totally unique cockpit ejection and parachute system. To be clear, the whole “passenger capsule” ejects, not just individual seats. Previous attempts at helicopter ejection systems that have used explosive bolts to jettison the main rotor before ejection have been less than successful. RUMAS’ approach represents an entirely new way of looking at the problem. Thanks to the additional lifting power of two tandem rotors and twin turbines (with a total rating of 465 horsepower) the Guppy also has impressive load carrying capabilities for the light helicopter class. The Guppy accommodates five 265 lb (120kg) individuals, can reach a cruising speed of 171 mph (275 kph). On top of this an external luggage load of 1650 lb (750kg) can be accommodated. The longitudinal design of the Guppy maximizes internal space and the lack of a tail rotor significantly reduce high frequency noise. This design also makes the ejectable capsule possible, by moving components such as the engine to the rear of the craft. It is estimated that the Guppy will sell for about 2.5M USD, a price directly comparable to the five-passenger Bell 407. Per hour flight costs are around 350-500 USD. Do you want to comment the Rumas A 245 "Guppy" helicopter?